If you’re looking for a trendy Halloween costume that requires little forethought and zero costume, this article is for you. Giraffes are the costume of 2017—searches for giraffe Halloween makeup are up 1200% on Pinterest. The good news? 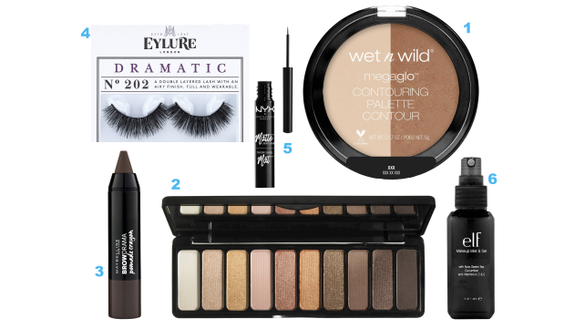 The look is extremely budget-friendly: All you need is some basic makeup. You probably have the necessities already kicking around your vanity, but if you don’t, each item can be easily found at a drugstore or online for under $10 a pop. This look is achievable for anyone, at all levels of makeup expertise. 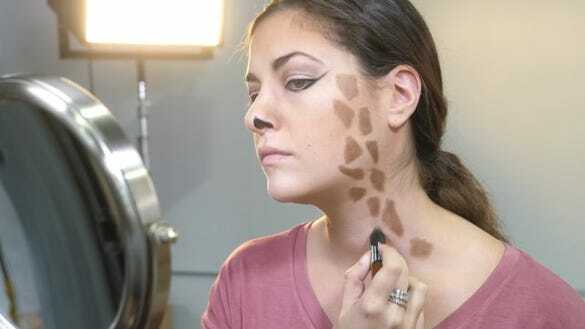 I transformed myself into a giraffe in under an hour, and I am by no means a professional makeup artist. 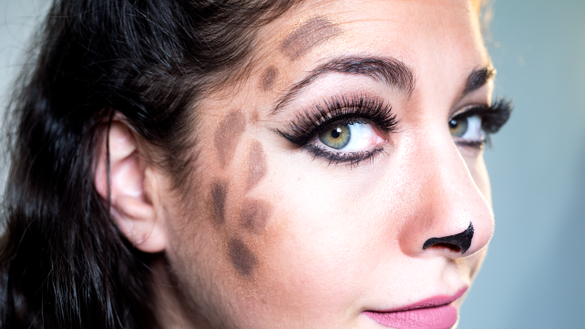 The “costume” is mostly about shadowing, big lashes, and of course, giraffe print. Here’s how to get the look for less. Chances are you won’t have to buy everthing—but even if you do, that’s a grand total of less than $40 for well-rated cosmetics you can use well after Halloween. 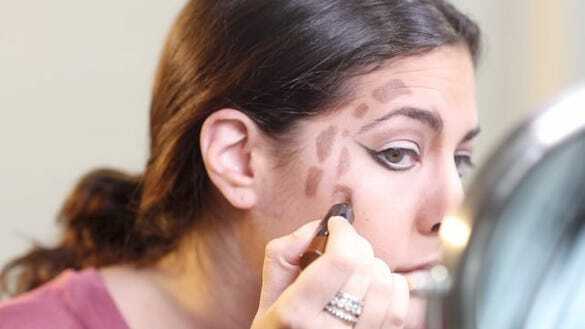 Using a sponge, apply the dark contour to the hollows of your cheeks, sides of your nose, and edges of your face. Don’t be afraid to be heavy-handed: It is Halloween. 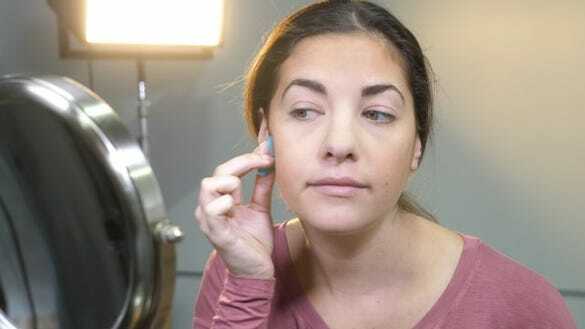 Next, using a different, clean sponge, apply highlighter to the bridge of your nose, under your eyes, your chin, forehead, and the entire eyelid area. Use a fluffy brush to blend any harsh lines or dark spots. Using a tapered brush, apply the second-darkest shadow to the crease of the eyelid. Bring the color up to your brow bone and blend any hard edges. Next, line the eye to feign big, fluttery giraffe eyes. Dip a flat brush into the darkest shadow and press it into the upper and lower lash lines, then extend out from the outer corners of the eye. Trace over the lines with black liner. You’re really going over-exaggerate with this dark liner to get a doe-eyed effect. Skip mascara for now! Take your black liner and outline your nostrils, and then extend the inner lines up to the tip of your nose. Connect the top of that line in a curvy, wave-like swoop down to the line on the outer edge of your nostril. 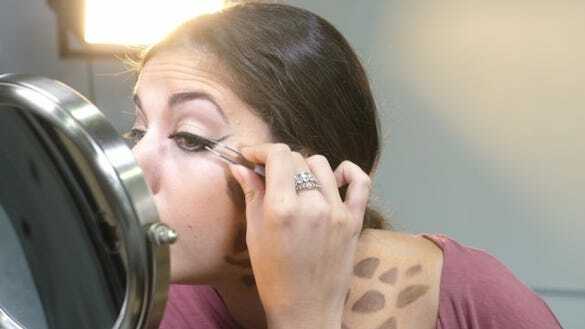 Fill in any bare spots with the liner. Take the thick eyebrow pencil, and starting on the upper right of the face above the eyebrow, draw geometric giraffe-print shapes. Continue to draw these shapes around to the cheekbone in a C-shape. On your left cheekbone, draw more shapes and continue the pattern down your neck to your collarbone. Make sure to expand the width of the pattern as you go. Fill in the spaces between the shapes with shimmery gold shadow from the palette with a sponge-tip applicator. 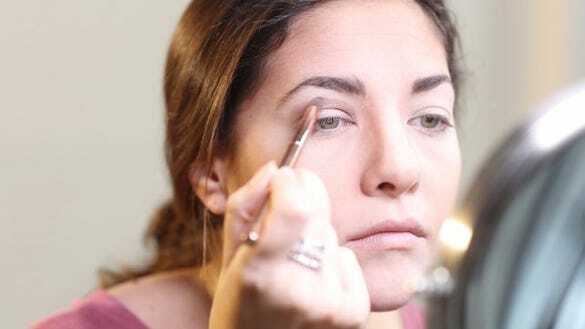 Press the color onto your eyelids, too: This final step really makes the color pop. Spray the living heck out of your face and neck with setting spray so your handiwork doesn’t rub or sweat off through the night. Wait a few seconds until the spray is fully dried before opening your eyes! Next, carefully apply false eyelashes and touch up your liner if any hard edges of the lash strip are showing. Finish with a hefty coat of mascara on your top and bottom lashes. Apply whatever lip color you have in your bag. Mine happened to be this dusty rose cream lipstick by Sephora. Finish with two twisty buns, or a giraffe ear headband (or both!). The former is budget-friendly and on trend, and the latter really drives home the outfit. The final step: Learn what sound a giraffe makes to authentically bother your friends all night. Happy Halloween!